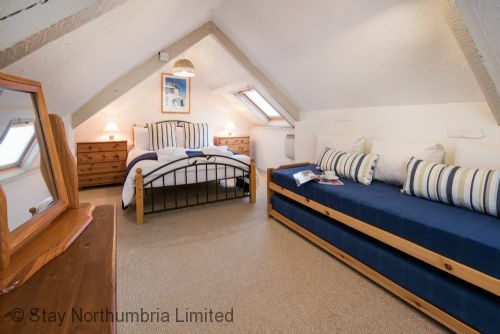 A stunning place to stay with fabulous views of the harbour,Farne Islands, Bamburgh castle,Lindisfarne castle only 50 yards from the accommodation. It has everything that you could possibly need for a self catering stay. The location is very central and is an excellent location for visiting lots of interesting places. There are many golf courses withing a short distance and some excellent walks inland or on the beach. Overall a fantastic place to relax. Many thanks for submitting a review of your stay at No2 Cliff House Cottage. We are glad you enjoyed your stay and find the location ideal for exploring Northumberland. We look forward to welcoming you back in the future. Many thanks for submitting a review of your stay at Cliff House No 2. We are glad you enjoyed a peaceful stay and hope to welcome you back in the future. My second stay in the property, and definitely not the last. Apart from the construction crew that can't be helped there is a blissful quiet about the place. Everything important to me (like the Harbor :-)) is within easy walking distance. There is parking. There are even sparrowhawks hunting the roof (advise: not for the squeamish) and pigeons cooing in the courtyard. Do bring a torch at night as that courtyard can be dark when you return, and the surface is charmingly uneven. Would recommend at any time, especially to those seeking refuge from work stress. Heavenly! Thank you for your fantastic 5* review! We are glad you enjoyed another stay at Cliff House No 2 and look forward to welcoming you back in the New Year! No. 2 Cliff House Cottages is just the right size for a couple, quite cozy with all the amenities such as a broadband internet connection and a fully equipped kitchen. The location is convenient, you can just walk out the front door and continue along the coast in either direction. Some days we didn't even bother with the car as it was easy to walk along to Bamburgh or Beadnell. We did find the parking a little tricky as there is a tight turn out of the property to the street, but then again the streets in Seahouses tend to be quite narrow anyway. We highly recommend the property for a beach holiday or just a weekend away. Thank you for your 5* review! 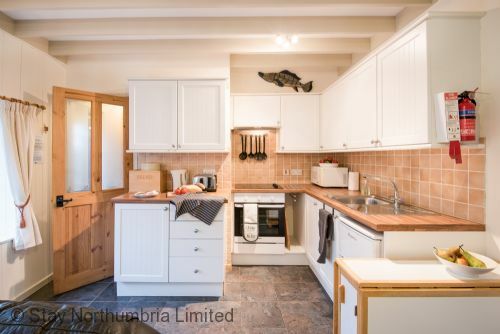 We are glad you enjoyed your stay in this cozy Seahouses cottage - we agree that having everything so close by is fantastic and you don't need to move the car all week! We hope to welcome you back in the future. This was - I think - our 6th stay in No. 2 and as usual it was very good. As there are 3 of us we particularly appreciate the extra chair provided to make our stay more comfortable. Many thanks for your review! We are glad you enjoyed another stay at No 2 Cliff House and look forward to welcoming you back next time! Clean and well equipped, this cottage is convenient to shops and public transport. We enjoy ed d our stay. This was the icing on the cake for a beautiful location. The only beef I have is the fact that the emergency number could not be reached on a Saturday even though on the first and second day, the door was extremely stubborn and often would only close after patiently trying for about 5 minutes, leaving a gap of nearly a centimeter. Maybe you could check and align the lock so this doesn't happen in the future - thx. Many thanks for your review! We are glad you enjoyed your stay at No2 Cliff House Cottage. We apologise for the problem with the emergency number and can confirm it has now been resolved as has the problem with the door lock! We look forward to your return in September! From the initial phone call with our request for a cottage for a short break , Beth was sure she could help and forwarded a choice for us to have a look at. We agreed to go for 2 Cliff House cottage , right price , right location ,even the right weather . The cottage was ,well equipped ,clean and the welcome pack was a nice surprise .We had three great days walking and enjoying the local restaurants and pubs , fish and chips outside taste better .The car never moved ,everything on the doorstep , a great short break , thank you very much . Thank you for your lovely review! We are glad you enjoyed your stay at Cliff House 2 and it was the ideal cottage for your requirements. We hope you plan on returning in the future. We so enjoyed our stay here. Cottage was lovely, very clean and welcoming, a lot of thought has gone into the needs of holidaymakers and it was so nice to have tea, coffee, milk and biscuits provided after our long journey. Another bonus was WiFi which we didn't expect. The bed was comfortable with a selection of pillows to suit everyone. The courtyard has picnic tables outside each property and even a bbq. Location is great, turn left out of the courtyard and you are opposite the harbour. Thank you for your fantastic review! 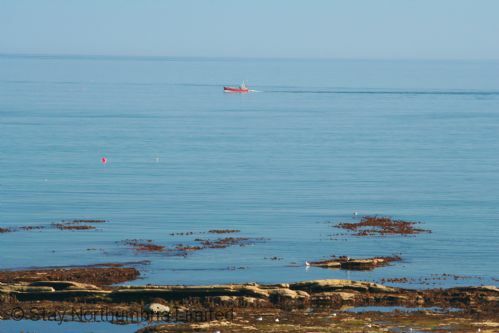 We are glad you enjoyed your stay at Cliff House Cottage and the close proximity to the harbour! We hope to welcome you back in the future. Lovely,cosy cottage, great location with everything we neded for a short break. Extra touches with welcome pack for the pooch and easter eggs for us :). Will definately book again. Thank you for your glowing review! We are egg-static that you enjoyed your Easter Break with us and look forward to welcoming you back in the future. The cottage was lovely, great condition and cosy. Brilliant location so close to town and the sea. Really quiet and peaceful courtyard. Nice welcome pack and we'll equipped. Only gripe is lack of mobile signal which can't be helped. Would stay here again. We are glad you enjoyed this cosy, coastal cottage. Unfortunately the phone reception in the property is weak due to the location, but the property does have wi-fi! Thank for you for your review and taking time out to do it. We hope to hear from you again in the future. 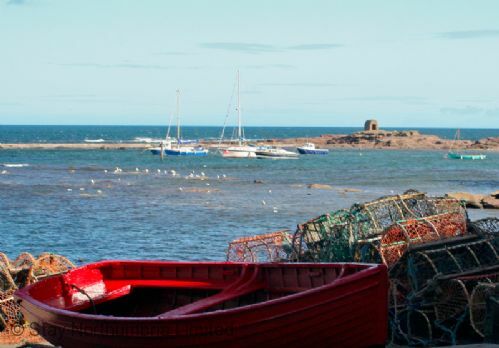 Seahouses village is a brilliant centre to move out from - either walking or driving. 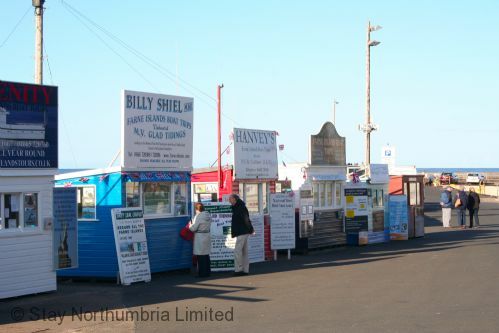 There are places to shop and a choice of eateries within Seahouses itself so everything is to hand if you don't want to go any further afield. The beaches are without doubt some of the best in Britain. Good to hear you enjoyed your stay in Seahouses and we agree we do have the best beaches in the country! Another great stay in a great place to stay! We had to contact the office and their response was first class. We're very impressed with the service we received. ...and another great review! Thank you for the kind words about the team at Stay Northumbria, we do try to help our guests. This was a lovely, clean cottage, perfect for our week away. The welcome pack of tea, coffee, milk and shortbread biscuits was a nice touch, as was the welcome pack of treats for our dog which she sniffed out as soon as arrived. 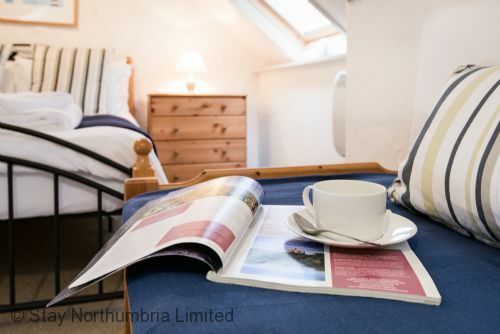 We thoroughly enjoyed our stay here, the cottage is situated in a quiet courtyard but is only a 2 minute walk to the harbour and centre of Seahouses. The cottage was cosy but more than big enough for 2 adults and a dog. The only issue we had was remembering to duck our heads in the bedroom as we hit them on the eaves a couple of times! 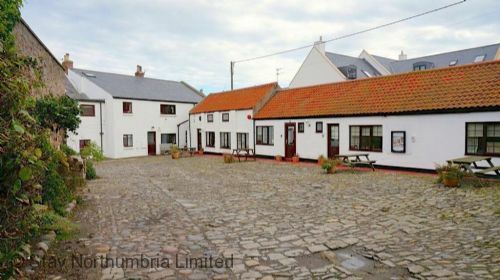 We will definitely look to book this property again the next time we want to stay in Seahouses. Many thanks for this lovely review. We look forward to welcoming you back in the future. Our 6th visit to this cottage in Seahouses. The location is excellent and a far better place to park than many others. It's a bit cosy for three but worth it. Staynorthumbria's customer service is excellent and I would not hestitate to recommend them - as indeed I already have. Once again many thanks for the super review and for your kind comments about our team here at Stay Northumbria. We look forward to welcoming you back again next year. Great little pet friendly cottage. Superb location to travel around the area. Great communication and service provided. Cosy little cottage in quiet corner of Seahouses, near the harbour, with everything we needed for our weeks holiday. The bedroom is in the roof space so headroom is limited; we are not very tall but this could be a nuisance to anyone taller. Wifi was fast & reliable which, while not essential for a good holiday, was something of a bonus on our cold wet days! Many thanks for the review and we are pleased to learn that you enjoyed your holiday in this cosy little cottage. However we do state that head height is restricted in the bedroom due to it being in the eaves. Good week spent walking on the Northumbria coast. Very good cottage with a welcome pack of tea and coffee waiting on our arrival. Only drawback is the low ceiling in the bedroom. Many thanks for your review of your stay at No2 Cliff House Cottages - we are pleased you enjoyed your stay. Many thanks for your lovely review of your most recent stay at No2 Cliff House Cottages - we are always pleased to welcome you back! Our 2nd stay at this cottage (3rd at Cliff House). Again, very comfortable stay. Excellent location. Thank you for the review, Cliff House 2 is a very cosy cottage. Food items, apart from the welcome pack, are not provided. With regard to the wi-fi, the owner currently has this in hand, extending from Cliff Houses 4 an 6. We look forward to seeing you again at Cliff House Cottages. Been to no 2 before and yet again the accommodation was superb. Great to find a place that not only caters for pets but provides a towel and treats for them! It was a wet weekend on our stay, but with the heaters on and a good whisky to sip we really didn't mind. there is a leak above the window near the door - we only noticed because it rained very heavily while we were there and found the floor covered in water. We put a bucket under it but it may need attention. We are pleased that you enjoyed your return visit to No2 Cliff House Cottages, Mr Hilton. We have noted your comment about water leaking and will pass it on to our maintenance team to rectify. Enjoyed 4 nights at no.2 Cliff cottages. 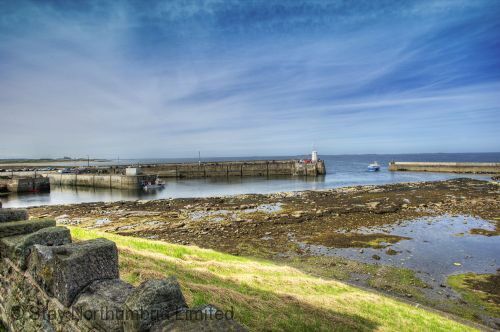 It is well located for amenities of Seahouses and visiting the beautiful Northumberland coast. Thank you for your feedback on your recent stay at No2 Cliff House Cottages. 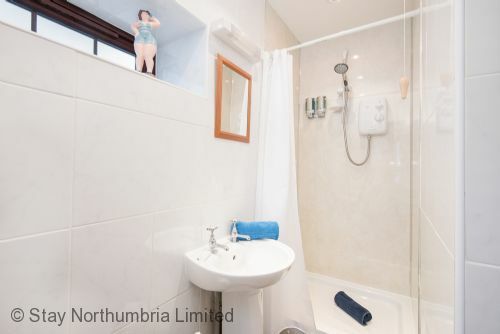 We are pleased that you were generally pleased with the cottage and its facilities, and we will pass your comments about the towel rail on to the owners. The cottage was cosy but had everything that you could need. We felt that the car park space was a bonus and the cottage was in a perfect location. With just a short walk to the local bars, shops and restaurants (and a stunning view on your journey of Bamburgh castle in the distance) everything was on your doorstep. The cottage had a lot of leaflets for nearby attractions but we would recommend a visit to Howick Hall and Gardens (for the woodland walks), Alnwick Gardens, Bamburgh and Holy Island. We would definitely recommend this accommodation and would stay here again. Thank you for the review and recommendation of our lovely cosy cottage. We would love you to stay here again in the future. Amazing on all counts, central, clean, cosy, reasonably priced. We had a lovely stay in a beautiful area. It was great being able to take our dogs (2) also with a nice welcome pack for them, that was a nice touch. Also having milk and coffee/tea there was a welcome sight. So pleased you enjoyed your stay in one of our cottages and thank you for the recommendation. 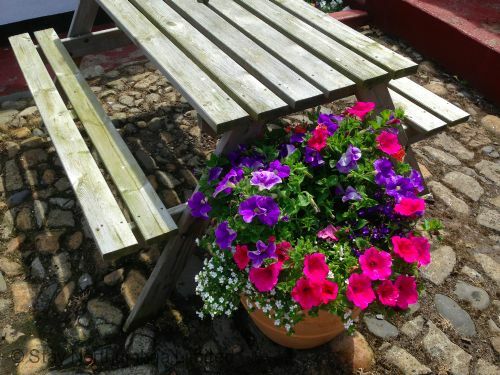 A 2 second walk from the sea-view this delightful cottage is set in a former herring yard. It feels really homely and far from the madding crowd - your own space in a busy and popular little village. The cottage is well equipped, and even when things go wrong they were put right straight away with no effort spared. Really lovely. So pleased you enjoyed your holiday at No2 Cliff House Cottages and that the Stay Northumbria team were able to help out when needed. Lovely cottage with good parking. The cottage was as good as ever - this was our fourth stay - and though a bit cramped for three of us the place and the situation make it worthwhile. The lack of a decent phone signal or WIFI - since we are all now totally dependant on our mobile - is a minor annoyance. Thank you for once again staying at No2 Cliff House Cottages and following our conversation regarding “a bit cramped for three of us in the place” you clarified that it was the armchair which was a little small. Please be assured this will be replaced before your return visit in 2017! Delighted to hear that you enjoyed your first visit to our beautiful area and that the cottage was cosy and well located. Thank you for your review and we would love to welcome you back in the future. Lovely quiet, cute and snug cottage with attention to detail. Excellent location for exploring the area as you can walk on to the coastal path or beach almost from the front door. Handy too for the ferry trips to The Farne Islands - just one of the highlights of our stay. Very good selection of places to eat and shopping only a short walk away. Would highly recommend the cottage as a jolly comfortable base at the end of busy enjoyable days. 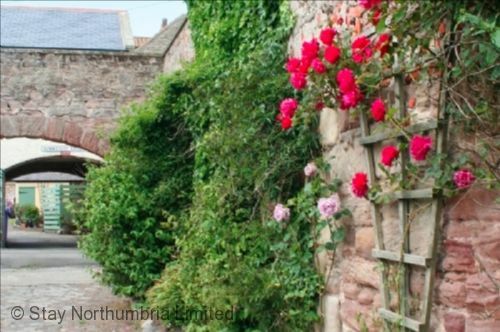 We really enjoyed our stay in no2cliff cottage,it is in a private courtyard,it is peacefull,and only a short walk to the harbour at Seahouses.The cottage was clean comfortable,had all you needed. We very much liked the cottage and the staff at Stay Northumberland very kindly allowed us to go in a day early, due to a snow forecast, which may have prevented us travelling the following day. The cottage is very nice and perfect for a short stay. If I had any suggestions to improve the cottage it would be that the shower is very weak and could be improved. It would also have been nice to have Wifi, although 3 days without internet access was probably a good thing. In a great location to the sea and amenities. Had everything we needed and more for a great short break. Comfortable and warm. Provided helpful information about things to do and places to visit. Located in the lovely little seaside visit of Seahouses. Fantastic stay in beautiful part of the world. We received good instructions allowing us to arrive stress free. In and unpacked we found a nice welcome pack and a file of easy to follow guides. The cottage was well equipped. A great location for exploring the coast. We walked miles, from Bamburgh to Craster. We are at the local Bamburgh Hotel. Had a few drinks at the local bars. A leaky shower hose and some early morning noises in the wall (reported) were the only issues. These didn't detract from an excellent stay. 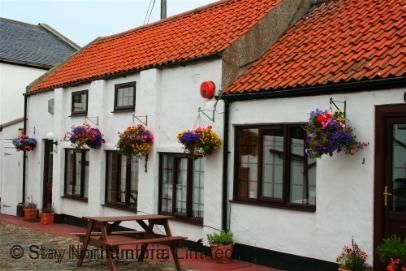 Delightful cottage near the sea in a charming seaside town. No 2 Cliff Cottages Seahouses was an excellent base for sightseeing along the Northumberland Coast. Cottage was small and compact but very clean, well equipped and comfortable . Fantastic short break - Cosy and comfortable! We really enjoyed our break away at Seahouses and are so pleased we chose 2 Cliff House to spend our 4 nights in the area. We chose the cottage with the bedroom upstairs; this made the cottage very spacious for the two of us and so you could easily accommodate 4 people. The cottage living and kitchen area are both very well equipped. There are some nice touches throughout the cottage that just add that extra bit of comfort. We cooked twice and found that we had everything we needed....and more! Location wise you certainly couldn't get much better and the courtyard is a mere 30 second stroll from the pretty harbour and easy reach of shops and pubs. We really did enjoy our stay here. We wouldn't think twice about recommending to family and friends. 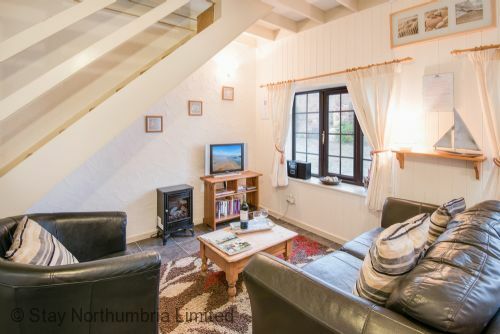 A comfortable and cosy base to explore to the beauty of Northumberland. The cottage was perfect for us and the location by the harbour excellent. Good to be able to just walk out at night to a restaurant.We highly recommend this cottage. My daughter and I had the most wonderful stay at Cliff House Cottages. The location was great and everything was provided making the place feel like a home away from home. We would definitely book again with Stay Northumbria the next time we visit. loved the no.2 cottage, courtyard parking,location, only 1min from coastal path, it could not get any better than this. Will recommend to everyone. Many thanks and hope to return in the future. Although a little cramped for 3 adults this cottage is well-equipped and very clean. The cottage is located in a lovely courtyard with good parking for one car - which is much better than many other cottages. It is also a good place to sit outside and enjoy your gin and tonic - weather permitting. As Seahouses is a real mobile phone black spot WIFI would be a really useful addition to the package. We found the cottage to be in a very good location cosy and clean just a couple things the bedroom ceiling height my husband kept banging his head on the beams,we struggled to find a plug for the hair dryer near a mirror,and the lounge was a bit too small to be comfortable and we did miss the sky tv on the wet days.Everything else was fine kitchen fine ,bed comfortable,all in all a good holiday. We recently had a four night stay at this cottage and were very pleased with the accomodation and with Seahouses itself. It lived up to our expectations and we look forward to another stay in the future. We would definitely recommend this to our friends and family. We thoroughly enjoyed our stay and will book again. The courtyard meant that we had our own parking and as parking is at a premium in Seahouses this is a must for any future booking. The cottage was compact and cosy - the weather was chilly so the heaters were required and effective. Everything had been thought of - even the K9 pack - very happy stay. 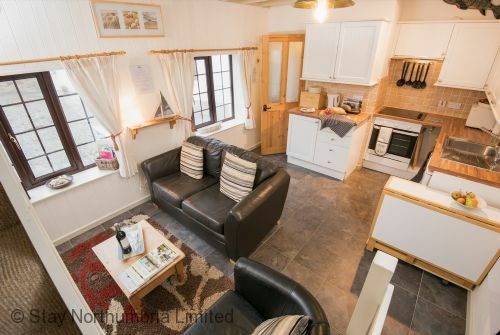 There is everything you could ever need in this small compact cottage with ample parking directly outside. The position almost on the harbour is ideal.